Photos and information from the events of 2013. Events are listed in order from December to January. Click on the links below for quick access! It's that time of year again! The Moveable Feast was held on December 6th, 2013 at the Fire Station in the Town Center. This event will began at 11:30 and conclude at 1:30. Thank you to Rosemary and Nancy for coordinating this event with Gloria. Thank you also to our wonderful volunteers who helped make this day great. We also would like to thank D'Agostinos and Stop & Shop as well as the Winchester Fire Department for allowing us to use their space. A BIG THANK YOU goes to our Winchester Town Employees for all that you do to make Winchester the wonderful place it is! Who Can Attend: Anyone! This event is open to the public as well as members of LWVW. Bring a friend! Recently two of the LWVW members attended this wonderful event in Boston, MA. If you were able to make it we would love to hear about your experience. Read our blog entry and add your own comments! If you missed the event and would like to see it, click this link to watch it. This link will only be available for 6 months after the event. 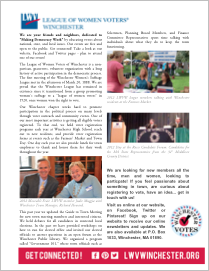 The League of Women Voters of Winchester will be holding our Annual Meeting on June 11, 2013 at the Winchester Unitarian Society Church at 478 Main Street. The meeting will take place from 7:00 to 9:00pm. We have a wonderful annual meeting planned! We will have a brief business meeting followed by some great events. First up is our Civic Leadership Award. We have chosen Carolyn Starrett as our recipient. Click here to read our article in the Winchester Star about Carolyn Starrett. After the presentation of the Civic Leadership Award we have a panel of current and past women who chose to run for local elected office and won! The participants are Betsy Cregger, Sarah Swiger, and Jennifer Wilson. They will be discussing what motivated them to participate in public politics and several other topics. We hope that you are planning to attend and bring a friend who may be interested in the League! LWVW members Heidi DiLeo, Juanita Zerda, and Susan Verdicchio planned an information session called “Re-imagine WHS: A Community Asset.” The goal of the session was to provide Winchester residents with an opportunity to learn from and talk with members of the Winchester high school renovation team. The WHS Renovation Project Website Where you can see the architects' drawings and presentation slides. EFPBC: Educational Facilities Planning and Building Committee A town committee made up of 11 appointed Winchester residents that prepares and updates a school facilities master plan and oversees design and construction of Winchester school facilities. LEED: Leadership in Energy and Environmental Design A voluntary program of the U.S. Green Building Council that has established criteria for sustainable or “green” building design requirements and certifies projects based on a point system, e.g., LEED Silver. MSBA: Massachusetts School Building Authority An independent authority established under MA law that makes grants to school building projects, enters into a funding agreement with owner of a qualified project and makes reimbursements as work is completed. OPM: Owner’s Project Manager An individual or firm with expertise in building construction who represents both the town and the MSBA. Maintains communication among project participants to realize the best results at the lowest cost. Skanska USA is the OPM for the WHS Feasibility Study. SMMA: Symms Maini & McKee Associates The architect and engineering firm for WHS project. We had a great turnout tonight at the Candidate Forum. 85 citizens turned out to hear what George Georgountzos and Jason Lewis had to say in this debate. Thank you to George and Jason for participating, to everyone who came to the LWVW event, to Patti Muldoon (from the LWV Arlington) for doing a wonderful job moderating for us. Thank you also to Stoneham TV and WinCAM for taping and broadcasting the debate on their websites. It is a very inspiring time! If you are a member and would like to go, you can! We will post when the next one is in our events calendar. Click on the link to open the FAN Spotlight PDF document. Members of the LWVW met Sunday to decide on actions they are recommending for the State League to develop over the next two years. Photo 2: From left to right - Joann Morgan, Marilyn Mullane, Dr. Paula Johnson (keynote speaker), Margot Sudbury and Maggie Russell. The 40th Anniversary of Roe v. Wade will be celebrated on January 14 at the State House in Boston by a coalition of ten women’s health organizations, including the Women’s Bar Association of MA, Planned Parenthood of MA, the Asian American Women’s Political Initiative, NARAL, and six other groups. 11:30 – 2:00. Lobby Day. Meet with Senator Pat Jehlen, Senator Katherine Clark, or Representative Jason Lewis to discuss and advocate for legislation to protect and expand access to sexual and reproductive health in our state.